Kenya is set to be the first African Nation to have an Underwater Museum when it opens the only museum of its kind in the world, in 2014. 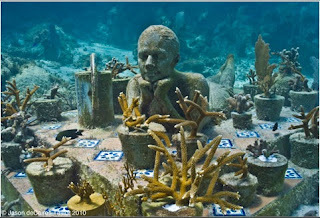 The ‘underwater museum’ will be situated at the Kenyan coast and will be part of the Malindi Marine National Park. Visitors to the museum will be treated to marine life spectacle of mantra rays, sea turtles, whale sharks, dolphins and shipwrecks. There are about 35 shipwrecks spread in Mombasa, Malindi, Lamu, Watamu and South Coast. The shipwrecks are remnants of the vessels Britons, Indians, and Portuguese used in the early Indian Ocean trade a century ago. They will be prepared for exhibition and fitted with underwater cameras to transmit live images to visitors above sea level. Kenya will join the USA, Britain, Mexico and China who boast of underwater museums and will serve as a major boost to the country’s tourism sector. Egypt is another African nation, which is also planning to open one in Alexandria.